The 18th century was a wealth of knowledge, exploration and rapidly growing technology and expanding record-keeping made possible by advances in the printing press. In its determination to preserve the century of revolution, Gale initiated a revolution of its own: digitization of epic proportions to preserve these invaluable works in the largest archive of its kind. Now for the first time these high-quality digital copies of original 18th century manuscripts are available in print, making them highly accessible to libraries, undergraduate students, and independent scholars.The Age of Enlightenment profoundly enriched religious and philosophical understanding and continues to influence present-day thinking. Works collected here include masterpieces by David Hume, Immanuel Kant, and Jean-Jacques Rousseau, as well as religious sermons and moral debates on the issues of the day, such as the slave trade. 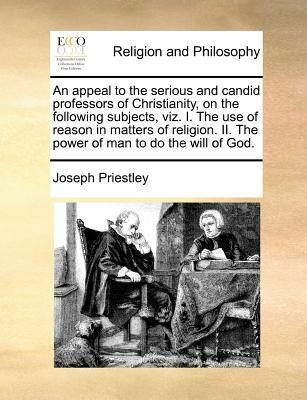 The Age of Reason saw conflict between Protestantism and Catholicism transformed into one between faith and logic -- a debate that continues in the twenty-first century.++++The below data was compiled from various identification fields in the bibliographic record of this title. This data is provided as an additional tool in helping to insure edition identification: ++++<sourceLibrary>British Library<ESTCID>W038289<Notes>With a half-title.<imprintFull>Philadelphia: printed by Thomas Dobson, at the stone house, no 41, South Second-Street, M, DCC, XCIV.! 1794]. <collation> 2], vi,52p. ; 12.